Aesthetics: The OtterBox is a staple when it comes to iPhone cases. It provides quality protection, but not without sacrificing style. While certainly slimmer than previous models, many have complained that the OtterBox Defender looks too bulky and unattractive. Rating: 3 out of 5 in aesthetics. Ergonomics: Due to its rugged design, the iPhone buttons can be hard to get to, the plastic may wear away over time, and it makes your device feel much larger in your hand than the iPhone 6/6s actually is. Rating: 3 out of 5 in ergonomics. Protection: Like all OtterBox cases, the iPhone 6/6s OtterBox Defender case is rugged and thick, providing maximum protection for your device. With multiple layers of protection, built-in screen cover and shock absorbing edges, the Defender provides top quality protection. 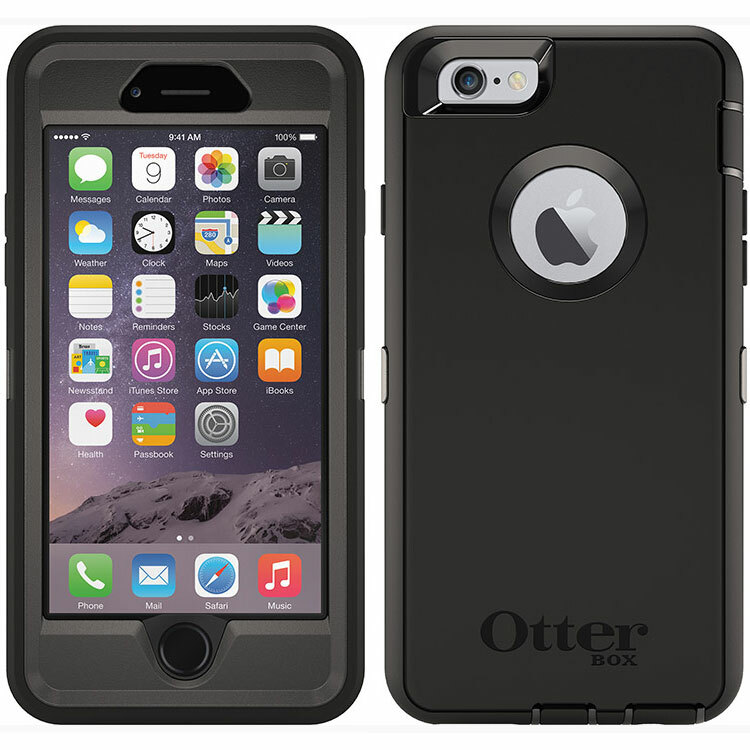 This is what makes OtterBox a trusted brand for many iPhone 6 and iPhone 6s users. However, there are a large number of consumers that are not totally happy with the film screen protector that comes pre-installed on the defender case. In fact, some sales clerks for large wireless retailers told us that they will remove the preinstalled film screen protector on the defender case and replace it with a tempered glass screen. It’s a great way to get a better quality screen protector, but it may cost the consumer an additional $30 to $40 at the large retail outlets. Rating: 4 out of 5 in protection. Price: The Defender is priced at $44.95 to $54.95 retail on OtterBox’s website, which is relatively high compared to most cases, but does come with a belt clip. Rating: 4 out of 5 in pricing. Customer Reviews: The Defender has received many positive reviews with 64% of consumers giving it an A. It is often praised for its protective qualities and durability. However, some complain that the Defender’s built-in plastic screen hinders the touch-sensitive functionality of the LCD screen of the iPhone 6 and iPhone 6s. Rating: 4 out of 5.